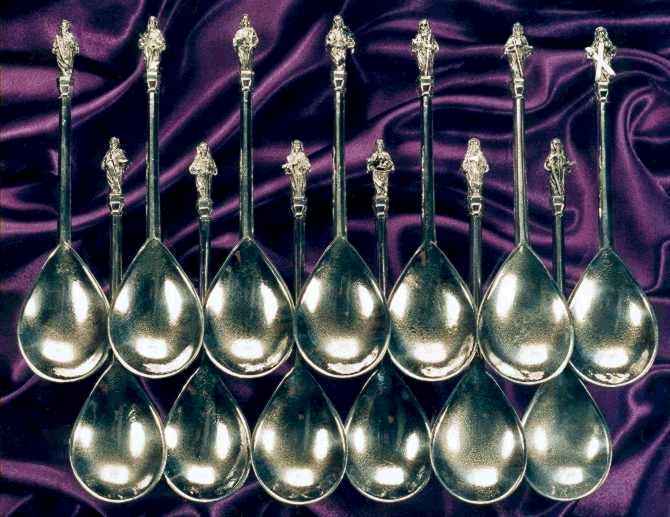 Apostle Spoons. Length 17cm. Price £ 6.50 each. Complete set only £65.00. earliest is dated to 1493, though they were most popular from 1500 to the 1660's. four complete sets are known to exist. Apothecaries: Saint James the Lesser. Blacksmiths: Saint James the Greater. Fishermen: Saints Philip and Andrew. Hatmakers: Saint James the Lesser. Labourers: Saint James the Greater. Pilgrims: Saint James the Greater. Saint James the Lesser. Also known as James the Just, he was the author of the first Catholic Epistle and first Bishop of Jerusalem. His mother was a close relative of the Virgin Mary and James is often referred to as the Cousin of Jesus. James was martyred in 62AD, stoned to death after being thrown from the pinnacle of a temple. His feast day is the 3rd of May. He is the Patron Saint of apothecaries, hatmakers, the dying and fullers. The spoon shows him holding a fullers club. Saint Bartholomew. Mentioned in the Gospels and Acts as an Apostle, and a close friend of Saint Philip who introduced him to Jesus. He preached in India, Asia Minor, Ethiopia and Greater Armenia, where he was flayed alive and beheaded. His feast day is the 24th of August. He is the Patron Saint of butchers, leatherworkers and shoemakers. The spoon shows him holding a butchers knife. Saint Peter. Brother of Saint Andrew and born with the name of Simon. Jesus named him 'Peter' and told him "To you I will give the keys to the kingdom of Heaven". 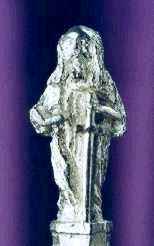 He was either martyred and crucified upside down or, says another legend, he was beheaded in a forest so that other Christians could not find and venerate his bones. His feast day is the 29th of June. 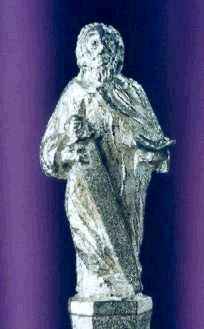 He is the Patron Saint of fishermen, clockmakers and locksmiths. The spoon shows him holding a key. Saint Philip. A disciple of John the Baptist, born in Galilee and a confidant of Jesus. He preached in Asia Minor and Greece, where he was crucified upside down in 80AD by the Emperor Domitian. His feast day is the 3rd of May. 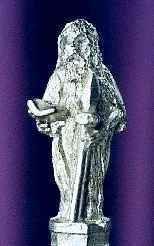 He is the Patron Saint of Luxembourg and Uraguay. The spoon shows him holding a staff with a cross in the 't'. Saint James the Greater. Son of Zebedee, brother of Saint John. He is termed 'The Greater' as he became an Apostle before the younger James the Lesser. James was a close friend of Jesus and was present at many of the miracles. He preached in Spain and Judea and was the first Apostle to be martyred. He was killed in 44AD, stabbed with a sword by King Herod Agrippa. His feast day is the 25th of July. 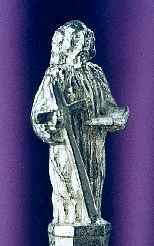 He is the Patron Saint of blacksmiths, labourers and pilgrims. 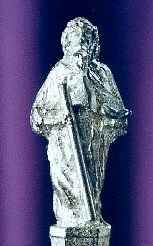 The spoon shows him holding a pilgrims staff. 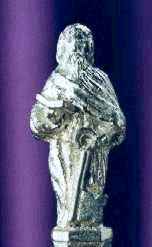 Saint Jude of Thaddaeus. Brother of Saint james the Lesser and a blood relative of Jesus, being the nephew of Mary and Joseph. He preached in Judea, Syria, Mesopotamia, Libya and Persia, where he was beaten to death and beheaded. His feast day is the 28th of October. He is the Patron Saint of lost or desperate causes, hospital and health workers. This is because of his New Testment letter which calls upon the faithful to persevere in adversity. 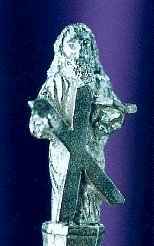 The spoon shows him holding a large cross. The Savior or Master. 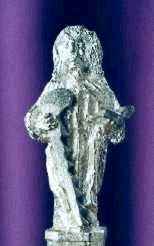 The spoon shows Jesus holding an orb and sceptre. Saint John. Son of Zebedee and Salome, and brother of Saint James the Greater. He became so close to Jesus that he was known as "the beloved disciple". He founded many churches in Asia Minor but spent most of his time in Jerusalem. He died of old age at Ephesus in 101AD, having survived all his fellow Apostles. His feast day is the 27th of December. He is the Patron Saint of authors, booksellers, engravers and painters. He is also Patron against burns and poisons. 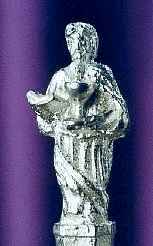 The spoon shows him holding a chalice or "the cup of sorrow". Saint Thomas. Also known as "doubting Thomas", as he doubted the other Apostles account of the Resurrection. It was eight days later on Christs second rising that he was allowed to convince himself by touching the wounds. He went to preach in Parthia and India where, in 72AD, he was stabbed to death with a spear. His feast day is the 3rd of July. He is the Patron Saint of architects, builders, stonemasons and the blind. He is also Patron against doubt. The spoon shows him holding a spear. Saint Mathew. Also known as Levi, son of Alphaeus, he lived at Capernaum on Lake Geneserath, where he worked as a tax collector. He preached mainly in Palestine and perhaps in Ethiopia. He was the author of the first Gospel, written in Aramaic, mainly for his countrymen of Jerusalem. He departed Palestine sometime before its destruction by the Romans in 70AD, and it is uncertain whether he was martyred or died naturally. His feast day is the 21st of September. 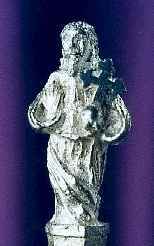 He is the Patron Saint of bookkeepers, accountants, security forces and tax collectors. The spoon shows him holding an axe. Saint Mathius. Became an Apostle after the Resurrection to replace Judas Iscariot. Choosing a replacement meant finding a disciple who had been with them from the beginning and who had witnessed the Resurrection. Eventually it was between Mathius and Joseph Barsabbas, so the two cast lots so that the Lord might make the choice. Mathius preached the Gospel for thirty years in Judea, Egypt and Ethiopia. He was martyred by stoning to death. His feast day is the 14th of May. He is the Patron Saint of tailors, carpenters and alcoholics. The spoon shows him holding a halberd. 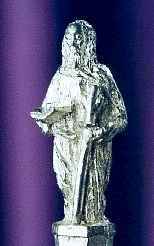 Saint Simon Zelotes (the zealot). So called because of his fervent adherence to Jewish law, or it may indicate that he belongd to a group of patriots who were prepared to revolt against the Roman occupation. He was one of the original followers of Jesus. He preached in Egypt and then went to Persia with Saint Jude. It was here that he suffered martyrdom, being sawn in half by pagan priests. His feast day is the 28th of october. He is the Patron Saint of sawyers. The spoon shows him holding a long saw. Saint Andrew. Born in Bethesda and a fisherman by trade. 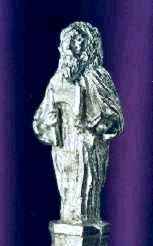 He was a follower of John the Baptist and then became the first Apostle. He preached in Asia Minor, possibly Russia and Poland, and then in Greece where he was martyred, being tied to an 'x' shaped cross, from which he preached for two days before dying. His feast day is the 30th of November. He is the Patron Saint of fishermen, maidens and spinsters. He is also the Patron Saint of Scotland. The spoon shows him holding a saltire cross.